Below is a list of unauthorized retailers that are NOT authorized to sell the “Sleep Right Pillow” or any other “SleepRight” or “SleepRight Rx” brand products The manufacturer Splintek, Inc, cannot guarantee the authenticity of products purchased from these unauthorized retailers or marketplace resellers. In many cases these products may be customer returns, unsanitary, damaged, defective, used or toxic made in China knockoffs. 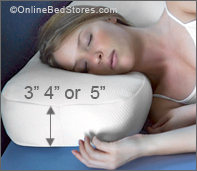 Sleep Right Pillows sold by “AUTHORIZED” retailers are covered by Splintek inc. 5 year warranty. Remember the cheapest price may wind up costing you the most. Amazon sellers will frequently change user names and web addresses so they cannot be reached to solve consumer problems. Other sites simply go out of business or are non-responsive to requests. Amazon – Please and Thank You LLC. Amazon – Reliable Business Partner, Inc.
Amazon – Shine Med/Den Supply Co.